The interconnected skills of Agenda Sports&Elements and our experience as a travel agency allow us to organise all logistical requirements for carrying out activities which companies plan to hold in the outdoors: conferences, networking, yearly meetings, sales presentations, incentives, etc. We can take care of everything: location, transport, accommodation, recreational activities and more. Talk to us and we will gladly give you all the information you need. Companies or any group of personnel that must work in a coordinated manner need to find mechanisms that foster productivity from teamwork. One method in achieving this is through team-building activities. Agenda can, upon request, prepare different options for team-building exercises and it can also be available to consultancy firms or human resource departments of companies for producing tailor-made programmes. The foundational aim of a simple team-building exercise is to encourage, through a fun environment, the communication, solidarity and empathy necessary for creating smooth work-group dynamics, while tearing down the barriers usually found in the workplace. 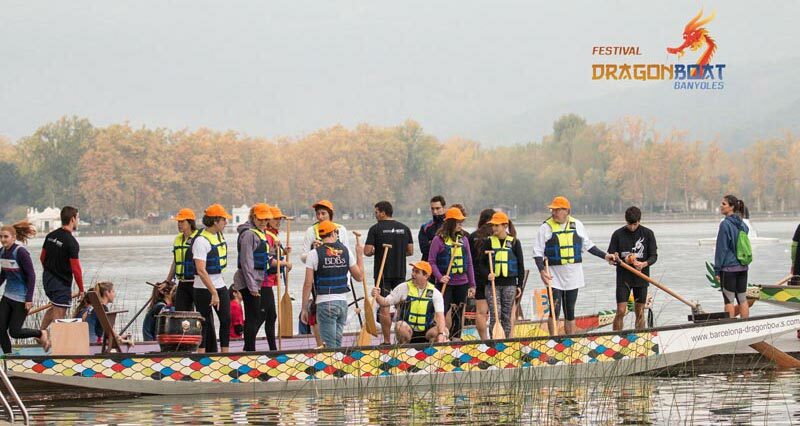 The Dragon Boat has become emblematic of Agenda Sports&Elements‘ offerings, to such an extent that it is now a specific business unit with its own structure, known as Dragon Boat Emotions, which allows its full potential to be explored. With the Dragon Boat as the core activity, many offers, combinations and different activity levels can be envisaged. It can be just a simple, fun introductory session for any group, or an offer for companies which involves a complex matrix of value creation requiring the participation of consultants. As a fun and motivational activity, it possesses an incentive in the form of the personal gratification gained in return for the effort exerted.